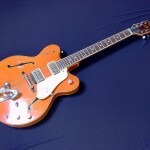 The single cut Gretsch Chet Atkins Hollow Body (6120) is a classic rock(abilly) guitar used by greats like Duane Eddy, Brian Setzer or Pete Townsend. In this episode of “stuff that’s gone” we will look at a typical 6oties double cut, fake f-holes model. Beware that the new reissue Gretsch guitars may look like the old one’s and in general are of better build quality, but for me they sound different. But now back to the actual guitar. This guitar is a good lesson that even when you want something badly, you have to look open-minded at the object of desire. 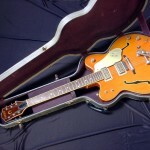 When I bought the guitar in 1991 I was looking for a single cut, open-f-hole model with Filter’tron pickups but I could not find one (they are rare and don not come often for sale) and even when I had found one, I could not afford it. So the double-cut model from a “honest” (vintage) guitar dealer seemed to be a good choice. The action of the guitar was high (a lot of old gretsch guitar’s are in the need of a neck reset) and so the playability was poor, but the tone was very nice. The guitar had one main issue (which you could easily see on the pictures) which the dealer “forget” to mention and which was not reflected in the asking price. 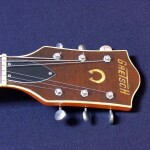 I had no experience with gretsch guitars, there was not a lot of information around and I was credulous. Some weeks later I recognized my fault – too late. So the lesson goes – know what you buy, ask a lot of questions and only believe in people who are trustworthy and who can assess there stuff (this requires in general that they have had a lot of these guitars in there hands…). 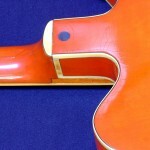 typical binding rot (which you can see starting at the neck joint). 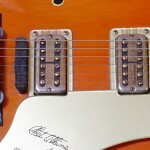 This is not a feature but a (cosmetical) problem with a lot of older gretsch guitars. To cut a long story short, these are great guitars for a specific type of music but you have to look at the neck angle and the action of the guitar. 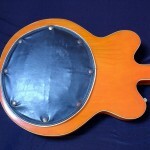 Do you guess the major alteration of the guitar? – the ebony fretboard with half moon inlays and the zero-fret was changed to a rosewood fretboard with dot inlays. 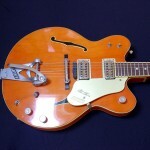 This entry was posted in gretsch, guitars (miscellanous) on 29. January 2012 by admin.